Here are a few tips to help care for your new purchase. Treat them right, and they will be your lifelong companion. Real leather is stiff but gives with wear. After 2-3 wears, they will stretch and mold to your feet. Wear thick socks at first to add some support until they break in. A natural leather dressing will keep your boots from cracking and will help to waterproof them. To keep your boots hydrated, keep them at room temperature. Avoid storing your boots in plastic bags. The COUNTRY is all about simple details. The triple-stitched cap toe design and signature red stitching offer a casual appearance. Our water-resistant waxed Portuguese leather ages beautifully with wear, and the commando-style Vibram® half-sole and heel protector ensure you can go anywhere. Like all Urban Shepherd Boots, the COUNTRY is made with a genuine leather midsole and heel counter, hand-laid cork footbed, hand-shaped stacked leather heel and Genuine Goodyear Welt Construction, a durable welt process that allows our boots to be re-soled repeatedly. Urban Shepherd Boots are handcrafted at a small, family-owned workshop in Benedita, Portugal where boots have been made for five generations. Only the highest quality materials are used in making Urban Shepherd Boots. We use only natural leather and high-quality components. We never use engineered or reconstituted leather. All of our leather is sourced locally in nearby Alcanena, Portugal, where many of our tanneries have been producing leather using traditional methods for over 100 years. *Our sizes run between a half and a full size small based on standard U.S. sizing. When in doubt, order a size up. 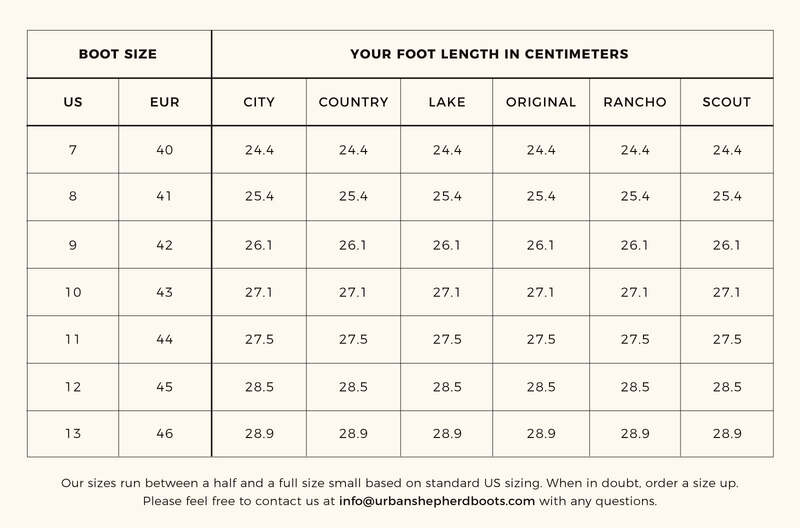 Please feel free to contact us at info@urbanshepherdboots.com with any questions. Free Shipping to US and Europe.